We offer this ring made of 925 Silver and 9KT gold featuring flowers all around. About 2 cm width. 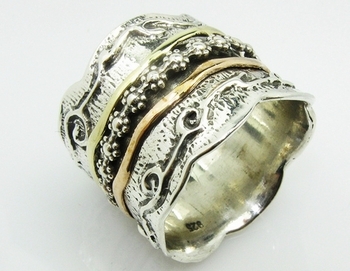 Sterling silver and 9 carat spinning ring . Sterling Silver 925 and 9 carat gold exquisite jewel . Magnificent Israeli silver and 9 carat rose gold stylish ring. Choose the ring that can be your uniquely fantastic styled silver and gold swivel wedding ring or engagement rings - or just your most beautiful ring as a present for yourself.